I hope everyone is enjoying the Christmas season! We have a new tree this year—since we’re in a new house that has higher ceilings than the last one, I splurged on a gorgeous flocked tree that is taller than our old one, and I love it so much I’m already dreading the day it has to come down! I’m about halfway done with my Christmas shopping, and thankfully my list was pretty easy this year. Most years I have at least one person I struggle to come up with ideas for, but this year I feel good about my choices. In my writing life, I’ve only written one true Christmas story—Sweet Southern Christmas, the historical story in Love Finds You at Home for Christmas. I never really gave much thought to penning another Christmas story. Which came as a shock! It’s no secret that I struggled—really struggled—to write the final story in my Arcadia Valley Series. A Reservation for Romance released last month, and after it was finally out into the world, I expected to take a big long writing break while I regrouped and decided what to do next. But then something funny happened—the first line of a new story popped into my head. And it was Christmas-themed. Try as I might, I couldn’t make it stop. That first line just wouldn’t leave me alone. Oh, I tried to ignore it for a few days. I’d push it aside only to have it come back again. So, I finally wrote it down, thinking maybe if I just got the opening down on paper, the nagging feeling would go away. That didn’t work. Soon, the first line became an opening paragraph. Then another followed. Soon, I had a chapter. And then I found myself creating a cast of characters and dreaming up a plot. And guess what? I found joy in writing again. Maybe it’s because no one is expecting this story, so there are no parameters I’m writing within. I’m just writing for fun. It’s been a long time since I’ve done that. And there’s a chance that The Trouble with Christmas will never see the light of day. Right now, it’s just for me. When I have a few minutes, I write a little more on it, just to see where it goes. It seems like the Christmas season has brought out my creativity, and for that I am thankful! 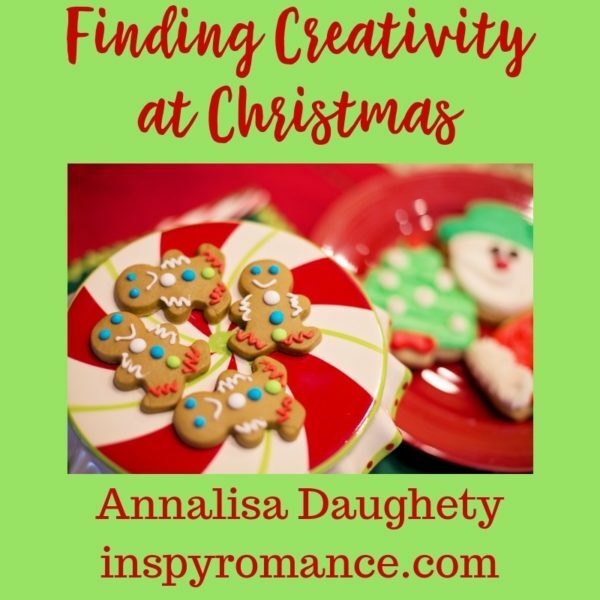 Hi Annalisa, I love how your Christmas story came to you and had to be written. Based on the title it sounds like a fun story. Thanks, Wemble! I’ve actually never seen The Polar Express–but one of our theaters here is showing it as a special Christmas show, so I will have to check it out! Hi Annalisa! Thanks for sharing your personal and writing journey this Christmas season. As a mom to three sons I enjoy watching the family dynamics in Home Alone. I watch Hallmark Christmas movies and so many are my favorites. Merry Christmas and best wishes. Thank you, Renate! Merry Christmas to you, too! My favorite movie is A Christmas Story but I’m also a sucker for Hallmark Christmas movies. I enjoyed one that I think was new last year that starred Candace Cameron Bure as twins who swithched places. Basically a grown-up Parent Trap. Jessica, I liked that one, too! I think it was called Switched for Christmas or something like that. She has a new one out this year–A Shoe Addict’s Christmas–and it was really cute, too. I so happy for that your joy in writing has returned. Have fun! Thank you, Kimberly! Merry Christmas! Thanks, Susan! Oh, we love the Grinch at our house! Our 13 year old has Grinch t-shirts and she wears them throughout the holidays. We’re planning to go see the new Grinch movie, although I’m partial to the original! Love your story! Merry Christmas! Thank you, Jackie! Merry Christmas to you, too! Annalisa–Yay for story inspiration. I love it when first lines pop into our heads. Great stuff. And I love all the Hallmark movies, too. I also found ION is showing a lot of ROYAL Christmas movies, so I”ve latched onto them as well. It’s become quite the thing these Christmas movies. I do love Christmas Vacation. :) And White Christmas. Thanks, Lindi! Oh–I love Christmas Vacation, too! :) We always watch that one at least once every year. My favorite Christmas movie is It’s a Wonderful Life…. I need the reminder sometimes. For the record, I absolutely loved your last AVR story, waited a long time for Brooke’s story!! Paula, We saw It’s a Wonderful Life on stage a few years ago–it is such a good story! And thank you so much! I’m so glad you enjoyed my last AVR story! Hi Annalisa! I love your story about your Christmas story. Thank you for sharing it with us. I play around with writing in a different genre when I feel myself needing a break. There is one particular story that I keep coming back to, but if it ever sees the light of day, it likely won’t be till I’m old and gray. ;) It is fun to write something no one else may ever read. I hope you continue to keep the fun in your writing routine. Merry Christmas! I think While You Were Sleeping is a kinda Christmas movie. I never get tired of watching it! Merry Christmas!